In the middle of a busy, stressful day what better way to relax , re-energise and re-focus than by taking a quick holiday at the beach. We all know what happens when the pressures of life overwhelm us. We know how increasingly difficult it becomes to maintain our focus and productivity. 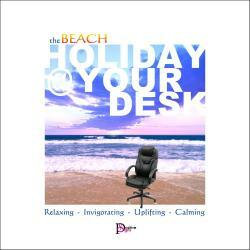 The ‘Beach Holiday @ Your Desk’ is designed to offer you an oasis in the middle of your hectic schedule. All you need do is take a short break, tune in and relax as the guided visualizations take you away. When you return from your ‘holiday’ prepare to feel so much better. And, when you feel more relaxed your focus and productivity may well improve proportionately.